Click here to see the Classroom Close-up Episode some powerful Mighty Fingers! 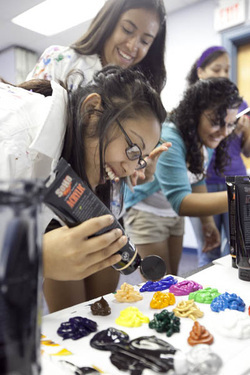 Empowering girls around the world through ART. Join the fun. 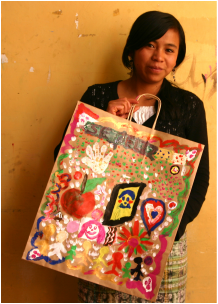 Through art, we are creating a global collaboration among adolescent girls and the organizations that work to support them, ultimately leading to strengthened communities on a local and global level. ​We are working to inspire, empower, and connect the next generation of change-makers. "I believe that ART has the ability to prevent war, but that doesn't mean we don't have to fight for it. Communities fostered in creativity and collaboration develop citizens who operate not from a fear of diversity, but from a true appreciation of it. An open creative spirit choose discovery over conquer, & beauty over battle. " Mighty Fingers Facing Change is a 2-part experiential art project designed to engage and inspire adolescent girls. My name is Kelly Sullivan and I have been creating collaborative art for over 20 years. Through this project girls celebrate their individuality through a guided self-portrait exercise, and feel the power of collaboration as they work together to design and execute the first ever global FingerSmear canvas entitled "Abundance." We also work to bring a unifying spotlight to the numerous organizations that improve the lives of women and girls around the world, day in and day out. Videogrpaher Toni Tru documents the participation of girls from varying cultures, signifying their connectedness and their ability to ‘paint a better future.’ She offers a vehicle for their voices, sharing their thoughts about building stronger communities. Mighty Fingers Facing Change focuses on power, affirmations, inspiration, and celebration. It is my hope that participating girls come through this experience knowing a bit more about themselves, empowered by what they've discovered, and possessing a heightened sense of awareness and compassion for the world around them. I hope that they will be moved by the power of will, and the might that is at their fingertips. women will remember and draw from down the road. A heartfelt thanks to Kelly, Beth, and your whole team. You are fantastic!" Thank You For Helping Create a Better World Through ART!